Let's be real today. Comparison...why do we do it? Last week The Girls With Glasses shared a video on comparison. I loved it so much that I think it's worth sharing. We all know how much I love these girls for obvious reasons, and maybe because they are my friends but they are so real and honest with topics we all can relate to. I love this topic because I see it being such a problem we all(including myself) fall victim to these days, and yet we have the power to prevent it. But how? We know how much we encouragement we need with comparison game when the top typography pins on pinterest are on comparison. We need constant reminders! Fore real. This comparison thing we have going on is a dangerous road. The trouble when we enter the comparison road is that our vision gets distorted. We become blind to our own value, and devalue our self-worth. Not worth it. The Girls mentioned this very popular print. 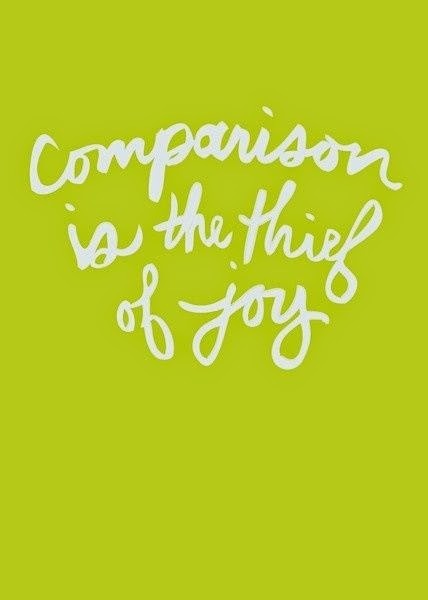 Comparison can really steal your joy and happiness. It can ruin your day, and sometimes week! And most importantly, don't let it ruin your life. 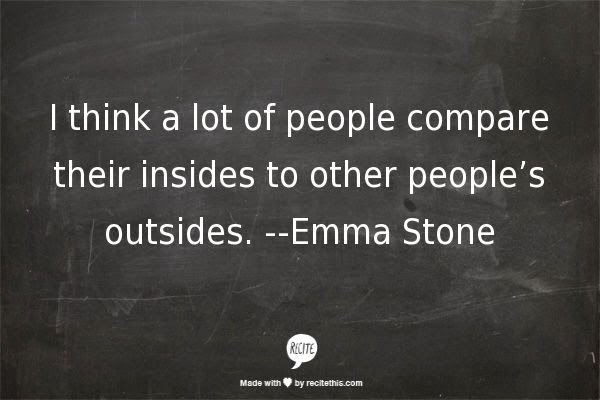 This quote by Emma Stone is something we all must remember. We are all on social media seeing what people portray through pictures, and we automatically think they are somehow better than us. We equal a pretty picture to mean happiness. And this is one of my favorites, I love this. Once I saw the word "strangers," I realized how foolish we are to compare our lives with people we don't know. This print is convicting to me. Social media is a tricky thing. It's meant to share highlights of your life, but so many misconstrue those moments as a whole representation of our lives. And then there are those trying to portray a perfect life when it's not and we believe that too. I too fall for it when I look at people's pictures sometimes. I think, how does so-and-so have time to do all that, or go there? But I'm sure many look have looked at my facebook or instagram and must think I spend my whole time baking, blogging, working on my house and eating out. But that's sooooooo not how it is. I'm currently sitting in my living room with crap all over, a sink full of dishes, and no clean white clothes. I made a cute cake this weekend, but my kitchen is suffering and has not recovered from the mess. I usually cook dinner during the week, spend days driving back and forth in traffic, and have a long to do lists, which only half of the things get checked off by end of the day. Obviously, I get moments when it's fun and those are the ones I share because those are the ones I want to remember. But that probably represents maybe 5% of my day, if that!! And even knowing that people are sharing snippets of their lives, we still can't help and compare. But we need to remember that at the end of the day, our circumstance and who we are haven't changed. We must accept who we are and embrace it. Is it easy? Heck no. But we must try, for our own sanity. And like the Girls said, if you need a break from social media, take it. You know how much self control you have! I can say so much more about this topic. But after all this talk, what I mainly want you know is how special you are, just the way you are. 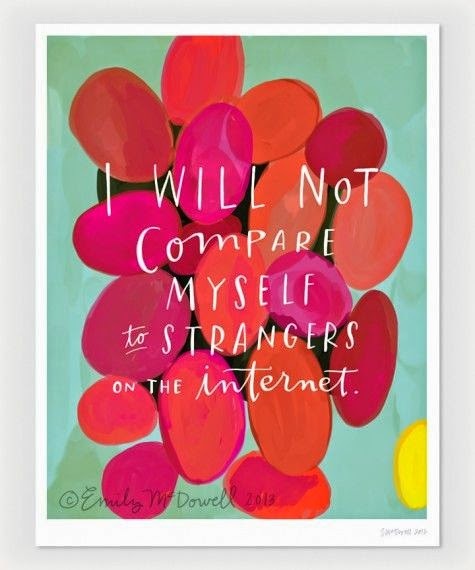 If we try to value ourselves through the eyes of others or through a comparison of others, we will be doing nothing but denying our own uniqueness. This journey won't be easy. But guess what? Comparing is a choice. We can decide to stop. So today, let's recognize our personal talents, and what makes us unique. Let's take control, and stop the madness.